According to Hans Penner of Elphinstone Logging Focus, there have now been sixteen arrests of persons blocking access to the Wilson Creek area of the Sunshine Coast Community Forest’s (SCCF) license area. Penner describes the 14 hectare Wilson Creek area of one of the last remnants of low elevation old growth forest remaining on the Sunshine Coast. The SCCF is operated by the District of Sechelt and lies within the traditional territory of the Sechelt First Nation. 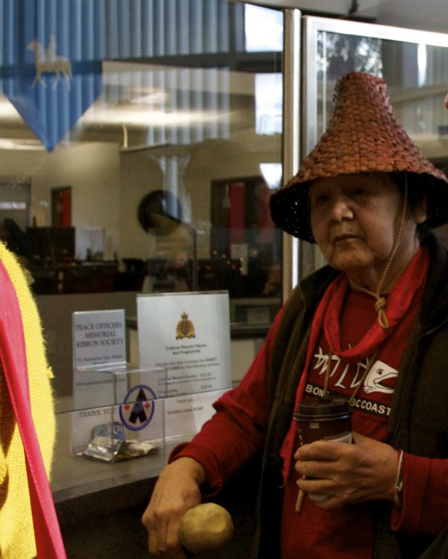 A Sechelt elder was one of those arrested. Elphinstone Logging Focus and the Sunshine Coast Conservation Association have been working to protect the Wilson Creek area for the last two years, because it is a rare patch of original forest with some trees that are over 500 years old. According to Penner, a fire in the 1860s kept the early loggers out of the area, and natural regeneration followed. The trees that survived the fire are now ancient. According to both the Sunshine Coast Conservation Association and the Elphinstone Logging Focus, the area of the blockade is part of the 15% of the Wilson Creek watershed that has not been logged. It has the biodiversity unique to old growth, with red legged frogs and 165 species of mushrooms. In the previously logged portion, Herz told the VO, 83 percent of the trees are under 100 years. Forty four percent are under 35 years of age. The park extension proposal put forward by Elphinstone Logging Focus and the Sunshine Coast Conservation Association would enlarge the existing Mt. Elphinstone Provincial Park, which currently consists of three isolated parcels totalling about 140 hectares. The new park would be 1,500 hectares in size. “This park has been talked about for years,” Herz told the VO. According to Herz, the entire area is known for its abundance of wild mushrooms. The original park was based on a mushroom survey that included a much greater area. The park extension would create a continuous, low level green belt that would be used by wildlife and nearby communities. It is included in the Roberts Creek Community Plan. The Sunshine Coast Conservation Association has long been critical of the lack of transparency of the SCCF. Most recently, Herz sent a letter requesting consultation on the park proposal ten days ago, and has not yet had a response. Meanwhile, the issue of logging in the Wilson Creek watershed is becoming a political hot potato. A recent meeting held by the Mayor of Sechelt, over 100 people attended and many wanted to know how to expedite the extension of the provincial park so that the ancient, standing forests of cut blook EW 002 would be included. “I think what has happened here in the last couple of weeks which the community has come to know as a unique forest is that exact opposite of what we expect of a true community forest,” Hans Penner told the VO.